Did you know, it is in the first 5 years that your child will easily retain a new language? What better way to learn than through this cultural-musical learning experience! More the reason to join this exceptional class only offered in Santa Barbara and Goleta! Learn two languages while you're at it...the language of Music and Spanish! Kindermusik with Kathy & Friends offers this exclusive and unique Cantemos !Let's Sing! Spanish Music Class with Ms. Jackie Pelaez. Fridays 9:30am in Goleta at Goleta Valley Church. Your first class is FREE to try! Immerse your child in the sounds, language and music of North, South and Central American cultures! Bring your Friends! Dance! Sing! Chant! Play Instruments! Cantemos! Spanish Time monthly cc subscription is $55 + $ for Spanish cd! 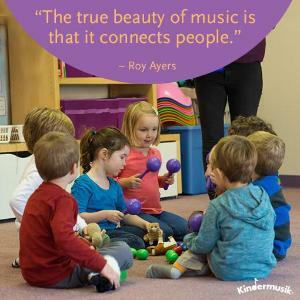 Class is only $5 Drop-In for families enrolled in another Kindermusik class. Cantemos enrollees can attend Kindermusik classes for $5 per drop in.